It’s true! After ‘What is a pilot watch?’ and ‘What is a chronograph watch?, questions about the various pilot chronograph functions are amongst the most regular that we’re asked at WatchGecko. So here, to complement our two-part article on pilot chronographs, is a detailed look at chronograph functions as they apply to pilot watches. And hopefully, the answer to the question, ‘What does a chronograph watch do (particularly if it’s an aviation chronograph). Of course, many of the characteristics also apply to chronographs that weren’t specifically designed for the aviation fraternity. So, what is a chronograph watch? The chronograph (literally ‘time writer’) is one of the most complex, sophisticated (or ‘difficult’ as the horologists say) watch complications that man has devised. Now, let’s quickly clarify another common misunderstanding: the confusion between chronographs and chronometers. A chronograph is not necessarily a chronometer, although some chronometers are chronographs. Back to The Watch Book for another definition: ‘A chronometer is a precise timepiece which has proven the accuracy of its rate during a 15-day test at one of the official watch-testing authorities, e.g., the COSC (Contrôle Officiel Suisse des Chronomètres) in Switzerland.’ Got it? Good, let’s get back to pilot chronographs. Ever since Louis Mainet experimented with his ‘Compteur de Tierces’ in 1816, or Nicholas Rieuss developed his (literally)’time writer’, man has been perfecting devices used to measure small amounts of time. Over more than a century, the ingenuity of watchmakers has led to a wide range of chronograph watch functions for sports, medicine, military applications and, since the invention of the aeroplane, for aviation. And that’s where we're going to focus now, as we look at the chronograph watch functions often associated with pilot watches. Just as unidirectional bezels and Helium release valves have insinuated themselves into dive watch culture, certain features have a similar role in pilot watches – and in particular, pilot chronographs. If a watch works within generally accepted accuracy standards, it’s going to be accurate enough for civilian aviation, and probably for many military uses. In most flying, accuracy to within ‘a few seconds’ is more than good enough. COSC-certified chronometers are not required! As discussed in our earlier article on Fliegeruhren, most of the original pilots’ watches, as exemplified by timepieces such as IWC’s 1940 Big Pilot watch, featured highly legible, heavily-lumed hands, numerals and indices. These were typically light-coloured for high contrast against a simple dark dial (usually matte black). Minimising distracting dial details (such as date functions and even manufacturers’ names) was usual, although evolution of these watches and refinement of materials and finishes means additional functions and details have found their way onto dials. Just compare the Big Pilot with IWC’s contemporary pilot watch chronographs, such as the REF.IW377704. You’ll quickly appreciate how the company’s designers and watchmakers have worked hard to retain readability and clarity while introducing sophisticated day, triple-date and three-sub-dial functionality. Of course, for legibility, some watches are better than others. But it says a lot about the changing role of wristwatches in aviation that many modern pilot chronographs are intrinsically ‘over-complicated’. They are often hard to read too, as well as difficult to use under some conditions. This is particularly the case when compared to the much purer visual language of early pilot watches. One of the greatest challenges to readability under any lighting conditions comes from pilot chronographs with slide-rule and tachymeter functions. 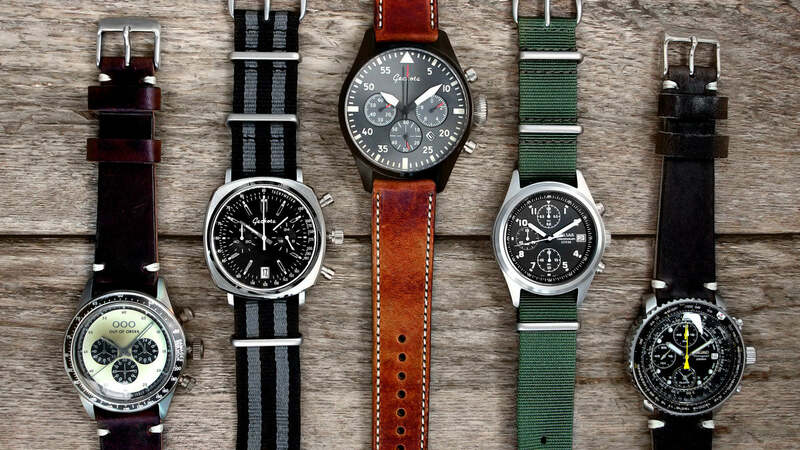 These are among the watches marketed most directly at the aviation community, such as Breitling’s iconic Navitimer or Seiko’s SNA411 pilot chronograph. Then there’s the way even the best non-radioactive watch luminescence will diminish rapidly after a few hours in a dark cockpit. That makes the watch even harder to use several hours into, say, a transatlantic night flight. Back in the days when dead reckoning air navigation was the norm, it was necessary to have a record of elapsed time along a chosen course. The term dead reckoning comes from DEDuced Reckoning, a form of navigation known to mariners for thousands of years. It involves plotting an aircraft’s position by calculations of speed, course, time, effects of wind, and previous known position. Flyback functionality (‘retour-en-vol’ or ‘instant restart’) has an important military aviation role as it enables a pilot to quickly read the timing for two consecutive events. For instance, when navigating between two waypoints followed immediately by the start of timing to a third waypoint or calculating consecutive average speeds. Alternatively, it might be used during a series of timed aerobatic movements that follow each other immediately. The beauty of the flyback function is instantaneous resetting. This avoids the extra workload and time lag of three pushes on two buttons (on a basic two-pusher chronograph). Now compare flyback with the rarer and much more complicated rattrapante stopwatch function. The word ‘rattrapante’ comes from the French word ‘rattraper’ (‘to catch up with’). A rattrapente complication (also ‘split seconds’, or ‘doppelchrono’ in German), uses two sweep hands (and sometimes also two hands on the minutes sub-dial). These hands can register two (but only two) consecutive intervals. With the mechanism reset, and despite having two seconds hands, the watch appears to have just one seconds hand. When the timer is started, the two hands rotate as one. However, when the stopwatch button is pressed, one hand stops. The other keeps rotating until it too is stopped by a second press of the pusher. Thus, two consecutive times can be easily recorded and the differential seen (for instance, when two aircraft compete on an air-race lap). From the earliest days of putting watches into aircraft cockpits, watchmakers were challenged to protect their precision movements from the effects of magnetism created by aircraft. Whether from the magnets in other flight instrumentation, or from having a two-metre long Merlin engine just in front of a Spitfire’s cockpit, magnetism and its ability to make watches inaccurate has always been the enemy of pilot watches. The initial answer (still used today, but with the addition of other refinements) involved including an iron Faraday cage to channel magnetism around the movement. More recent innovations include using specialised alloys for balance springs and the latest amagnetic silicon hairsprings. The rotary slide rule on your pilot chronograph has its origin back in the the days before widespread availability of electronic calculators, smartphones and the other modern calculation devices that are ubiquitous today. Remember that within the lifetime of the writer, and probably that of some readers, navigational calculations and complete aircraft design were done with slide rules! Originally popularised by Breitling on its 1952 Navitimer, the miniature rotary slide rule has become one of the features most readily associated with pilot watches and chronographs in popular perception. As a Forbes article explained, the rotary slide rule is more than just a redundant historical vestige. It’s an adaption of the E6-B ‘whiz wheel’ flight computer developed in America in the 1930s. In fact, it’s the same manual flight computer that is still used in basic training for civilian and military pilots the world over. Knowing how to use chronograph watch functions such as the slide rule is undoubtedly impressive – whether in the airfield ops room or down at the pub. If you know how to operate it, the rotary slide rule on your pilot chronograph bezel can still be used for a wide range of general calculations as well as aviation-specific calculations. The latter include metric: Imperial conversions, air speed and rate of descent calculations. Be warned though, using the rotary slide rule on a Navitimer or Seiko SNA411 is fiddly, especially in a cramped, dark cockpit, in turbulence, under IFR flying conditions! With one or more accurate cockpit clocks, calculators, smartphones and other aids in most modern cockpits, fiddling with the 42mm-diameter rotary slide-rule on your pilot watch may be more of a nuisance than a benefit! This is another scale typically associated with chronographs and not to be confused with the ‘telemeter’ scale that appears on some chronographs for calculating the distance of an event such as artillery muzzle flashes or lightning. 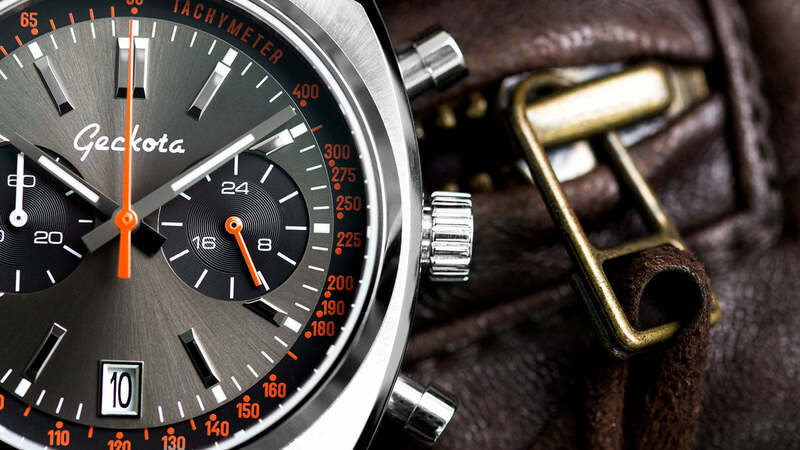 A tachymeter is for calculating speed (based on travel time) or distance based on speed. It’s simply a way to convert elapsed time into speed (in units per hour). In the case of aircraft, that means conversion of airspeed to ground speed. Depending on the watch, the tachymeter may be engraved or printed around the watch circumference or as a spiralling scale about the centre of the watch face. This refers to a mechanism that enables you to stop a watch's seconds hand by pulling the crown out to the time-setting position. By doing this, the watch can be set precisely against a time signal or synchronised with a reference watch. Though not specifically mentioning pilot chronographs, pilot watches, or ‘hacking’, this responsibility was central to an amusing scene in Joseph Heller’s classic 1960s novel Catch-22. You can read it on pages 236–8 of the book as Major Danby, the officer presiding over a mission briefing, is frustrated in his attempts to get aircrew to synchronise their watches amid various other mayhem. Heller writes: ‘…in front of Major Danby, who with his earnest, persevering head down, was still concentrating on his wrist watch and saying, “…twenty-five seconds…twenty…fifteen…” ’. Returning to the practicalities of ‘watch hacking’ in aviation, in his highly detailed and painstakingly researched article in the December 2006 issue of The Horological Journal, German military watch expert Konrad Knirim describes Luftwaffe crew members synchronising their service wristwatches to their navigator’s B-Uhr. In turn, this was synchronised with the pilot’s chronograph, which was ‘synched’ with the ground-based chronometer in the airfield ops room. The latter was in turn synched to the central Seewerte (observatory) in Hamburg. In 1853, Tissot made the first dual time-zone watch, a watch that can display local time and time in one or more different time zones. The idea has evolved, through many manifestations, into what is nowadays probably the most useful function of a chronograph or standard watch for most long-haul pilots. As Ryan Schmidt explains in The Wristwatch Handbook, ‘when the wristwatch was conceived, there was not a great deal of global travel, nor was the world strung together by cables, satellites and cell towers.’ How communications, aviation and watches have changed since then. Following the rise in long-distance rail travel in the 1850s, the 1884’s International Meridian Convention established the prime meridian at Greenwich, and the adoption of the 24-hour global time zone concept that we take for granted today. Later, growth of international air travel in the 1940s and 1950s increased the requirement for pilots and travellers to be able to quickly tell the time across one or more international time zones. The simplest way to do this is with a mechanism that links the time in the two time zones – hence the dual-time complication as demonstrated on chronograph and non-chronograph watches such as the Rolex GMT, IWC Pilot Worldtimer, Breitling Chronomat GMT, Chronoswiss Timemaster GMT, George J. von Burg GMT Fly-back and Vulcain Aviator GMT. By having a 24-hour register, separate dual-time hand and rotating 24-hour bezel, it’s possible to monitor time in three different time zones. Or for a home time, destination time and Universal Coordinated Time (UTC), the world aviation time standard. Related to dual-time watches are so-called ‘world timer’ watches that simultaneously show time in some or all of the world’s time zones – usually identified by a display of exotic city names that represent the time zones. As an aside, fascinating article in the online Financial Times analysed the places used to represent the different time zones on 25 different World time watches from 1951 until the present (World time watches tell a story of wealth and power – www.ft.com, June 2, 2016) and found significant differences in the places mentioned between 1951 and 1971 and those mentioned between 2005 and 2016. Although a handful of cities (London, Tokyo, Sydney, New York and Rio de Janeiro) maintained their place, many others changed – something the FT interpreted as reflecting changing concentrations of wealth and power around the world. Worldtimer functionality is often included with chronographs. For example, at the very affordable end (sub-$350) is a watch such as the quartz-powered Junkers Worldtimer Chronograph Watch 6892-5. At the other extreme, Patek Phillipe’s 5930G World Time Chronograph will put the best part of $75,000 on a (very well paid) pilot’s credit card! As mentioned above, world timer watches such as the Breitling Transocean Chronograph Unitime are characterised by having city names circumferentially, radially around the dial, or on a sub-dial. They may be manually operated (as on the highly affordable, but non-chronograph, Seiko J Springs World Time), or work through sophisticated mechanical integration with the rest of the movement on more expensive watches. That’s about it for now. We hope we’ve satisfied your curiosity and that you’ve enjoyed this overview of some of the features and characteristics of pilot chronographs. Hopefully you’ve found the information helpful – whether you wear one of the affordable Seiko or Citizen chronograph watches, or a luxury Breguet, Omega or IWC chronograph. For further detailed information, we’d recommend The Wristwatch Handbook: A Comprehensive Guide to Mechanical Wristwatches by Ryan Schmidt, Chronograph Wristwatches: To Stop Time by Gerd-R. Lang and Reinhard Meis, The Watch Book I by Gisbert L. Brunner and Christian Pfeiffer-Belli and The Watch Book II by Gisbert L. Brunner. Have you got another question about pilot watches in general, or pilot chronographs in particular, that you’d like us to answer? Perhaps you would like to tell us your thoughts about the best chronograph watch for pilots? Or you have another question about watches and watch straps? If so, please contact us through our customer service email and tell us. Who knows? Maybe your question will inspire a future article on the website. We look forward to hearing from you.